Sponge cake is the basic and building block for all other fancy and layer cakes in the world. This simple sponge cake does not require any fancy machine or oven, we are going to bake this cake on a tawa / frying pan. Step 1) Into a bowl add egg and whisk well. If you do not like egg then add 1/4 cup of yogurt instead of egg. Step 2) Now add Milk, Oil, Sugar, vanilla extract, soda, salt and mix well. Step 3) Finally add maida and mix the batter without any lumps. Step 4) Grease a nonstick pan with butter and transfer the batter and cover. Step 5) Cook on very low flame for 15 - 20 minutes. It took 17 - 18 minutes for a 10 inch pan. If you are using a small pan then bake it in 2 batches. Cake is done when the top of the cake doesn't stick to your hands. 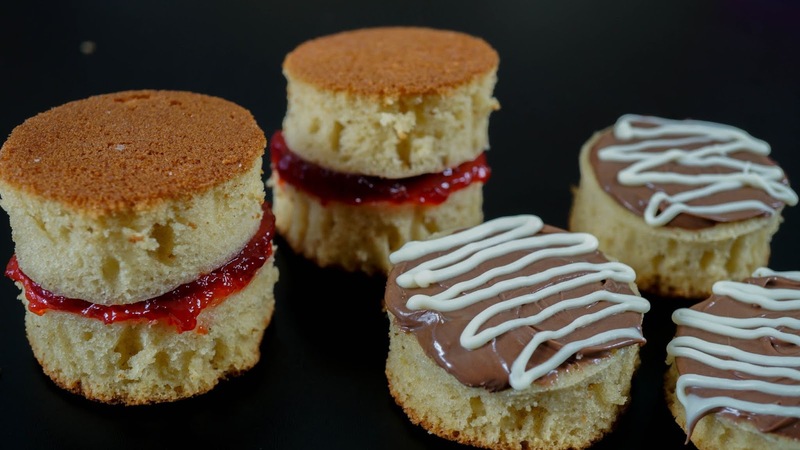 I have cut the cake into small rounds and topped wih Jam and chocolate for extra fun. Please do try this easy tawa cake and share it with your family.